"The Internet has eliminated the need for art galleries," said a very famous artist to the crowd at the American Artist Weekend With the Masters event. "Why pay the commission when you can sell direct online?" That comment sparked a great debate in the halls of the hotel in Dana Point, so I wanted to address it in my art marketing sessions. Can You Live Without A Gallery? So what about you? What should you do as an artist? Can you live without an art gallery selling your work? Can you sell direct online and eliminate the need for a gallery? Let's explore this now. Clearly, the Internet has changed everything. It's true that an artist can abandon the gallery system and sell direct online to eliminate paying a gallery commission. For some, especially those who are well-known and well-established in their careers, it might make sense. But you have to ask yourself: Who established the careers of those artists who no longer need galleries? If I were to ask those artists, they would tell me that it was their reputation that established them, and the quality of their work. No doubt. But there are countless very talented artists who remain undiscovered. Chances are some art gallery professional helped establish the careers of most prominent artists. Chances are those artists built their reputations through exposure to gallery customers, advertising, and a sales effort. Furthermore, galleries were probably responsible for gradually driving the artists' prices up over the years. It's easy to say an artist can do without a gallery, and maybe you can. But most artists I know with websites aren't selling enough art online to make it on their own. Why? Being on the Web and expecting business to come through the door is like being in the phone book and expecting the phone to ring. It's simply not enough. If you want to sell online, you need to drive traffic to your website, and you need to do it constantly. That requires promotion. That famous artist is right: You can live without a gallery. I can think of several high-end artists who are doing without a gallery. But they also have full-time people focusing on their careers, working on promoting their careers, and driving traffic to their websites. Unless you can take the time and spend the money to build your reputation online, ratchet up your prices, and spend money on advertising and search engines to get people to come to your website, you may find that a gallery is a good partner to have after all. In the recording industry, an artist can gain exposure and sell music online without a record company. But those who succeed at it are promotional superstars who know what it takes to get noticed. Meanwhile, others rely on the record labels, which are really great at marketing. It's no different with selling art. You can do it on your own, if you can be a promotional superstar. But without that, a gallery might be worth its weight in gold, commission and all, IF they are selling art, building your reputation, and driving your prices up. Last week a gallery owner called me and listed all the things he does to help sell artwork, including paying high rent to capture walk-in traffic, advertising, mailers, e-mailers, shows, calling collectors every day, and more. A successful gallery is a great partner because it can be your promotional superstar. Do you have someone to do this for you? Can you devote eight or 10 hours a day to selling and marketing? If not, suddenly that gallery commission looks pretty attractive. In my seminar, I talked about never having a single point of failure in anything you do. For instance, if all your income comes from one gallery and that one gallery goes bankrupt, you're out of luck. Or if you're doing your own marketing and it's ineffective, that single point of failure will hurt your personal sales. It's why I think having enough galleries to sell what you need sold is a good idea. My friend Charles told me last week that he has five new galleries because I told him to keep adding galleries until he was making the money he needed. He told me this has been his BEST sales year in the last five because of it. He found all five galleries through my magazine Artist Advocate (see below.) Rather than being hung up on not having a lot of galleries, he is focused on having more than he needs, and it's made his income soar. Selling online is a great opportunity if you can pull it off. If not, the art gallery is still a very viable option and the perfect partnership. 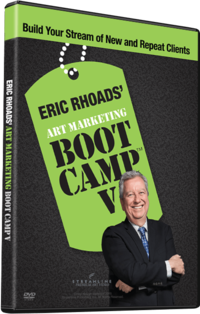 Visit my free art marketing blog and free Blue Chip Gallery marketing blog. PS: My magazine Artist Advocate is mailed to 6,500 art galleries that sell original art. Its primary purpose is to showcase the work of artist seeking additional galleries. If you want to learn more, contact Charlie Bogusz at [email protected] or 970-227-4878. The next issue of Artist Advocate has several new features to draw galleries deeper into readership.